Weather permitting the Baltimore Orioles and the Kansas City Royals will open the 2014 ALCS tonight at Camden Yards. Here’s a sample of a few other moments from game 1. Weather permitting. Fans will get their early for batting practice and Boog’s BBQ. Somebody important, maybe a senator or reality tv star will throw out the first pitch. The announcers, including Cal Ripken Jr., will make over 100 references to the 1985 and 1983 ALCSs, the last time the Royals and Orioles won the pennant respectively. 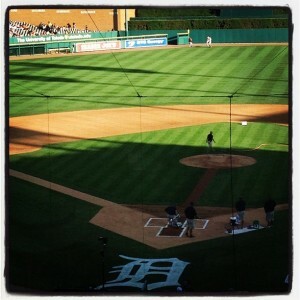 Chris Tillman will throw a first pitch fastball strike to Royals leadoff hitter Alcides Escobar at approximately 8:07. Tillman will end up walking Escobar on 8 pitches leading Orioles manager Buck Showalter to ponder when is too early to go to Andrew Miller, Darren O’Day and Zach Britton in the bullpen. The next batter Nori Aoki will hit into a 6-4-3 double play and Showalter will instantly regret thinking about bringing in a relief pitcher even though we will never know or hear about his indecision because he is a baseball genius who never makes mistakes. If at the the beginning of the 2014 MLB season you had the Baltimore Orioles and the Kansas City Royals in the ALCS then you’re lying. Either that or you should let it all ride in Vegas because you might be on the verge of a lucrative lucky streak. We’d be more inclined to believe you if this were the 1980s and parachute pants ruled over skinny jeans. Back then the American League was aligned differently, the gap between markets large and small much less defined. Long are the days of Whitey Herzog and Earl Weaver. Believe it or not, this is the first time since 1997 that the ALCS hasn’t featured one of four teams: Boston Red Sox, New York Yankees, Detroit Tigers or Los Angeles Angels. Ironically, ’97 was the last time Baltimore played in the ALCS while Kansas City hasn’t made it this far since 1985. The Orioles and Royals have many similarities and differences. Baltimore hits home runs while Kansas City steals bases. Both have lock down bullpens, young lineups, solid starting pitching and play above average defense. Each team is built to win now. Next season the Orioles may be without Nelson Cruz, Nick Markakis and JJ Hardy while the Royals will in all likelihood lose staff ace James Shields. Buck Showalter traditionally manages laps around Ned Yost but the Royals have belief especially since their Wild Card comeback against the Oakland A’s. Home field advantage is a real, palpable thing especially for crowds unaccustomed to October baseball. You won’t find many fans in either Camden Yards or Kauffman Stadium who have been spoiled by success. BBQ and crab cakes aren’t the only reason to root root for the home team and for two cities where the NFL has been king, this ALCS will be a refreshing reminder of the once proud yet too often overlooked tradition of both franchises. Non partisan baseball fans will enjoy watching Baltimore/Kansas City because of the nostalgia while fringe fans will appreciate the novelty of this once in a generation ALCS. If not, there’s always football. After outlasting the Seattle Mariners in an epic 5+ hour, 18 inning affair that ended around 4am EST, the Baltimore Orioles have decided to call up prized 19 year old pitching prospect Dylan Bundy to help provide some much needed relief for an overtaxed bullpen. This news makes me incredibly happy. For months now I, like most O’s fans, have been drooling on my keyboard while watching highlights like this. It’s gotten to the point where my baseball arousal level is so high that future links to Bundy’s pitching exploits should be labeled as NSFW. His numbers in the minor leagues are equally as provocative. 9-3 with a 2.08 ERA striking out 119 in 103 innings while only giving up 67 hits. These are just the sort of numbers that can force Oriole fans to jump into a cold shower. And now Dylan Bundy is flying up to Seattle where he will join the big league club for their series finale against the Mariners this evening. It’s much too early to say what kind of impact he is going to make on the field. Chances are he’ll conduct his business from the bullpen which has been so, so good for the Birds all season long but could also definitely use a fresh arm down the stretch. Bundy’s call up has a chance to make an even bigger impact in the clubhouse where his Orioles teammates will instantly recognize and appreciate the front office’s willingness to contend this season. With only 14 games remaining in the regular season Baltimore is one game in the loss column behind the Yankees for the AL East lead and 3 games ahead of the Angels for the second wild card. “Wait till next year” is not a phrase Oriole fans care to hear this September, not when we’ve been accustomed to losing for oh so long. And now Dylan Bundy’s coming to Baltimore and we couldn’t be more excited. Baseball fans, like baseball players, are superstitious. The way we watch and talk about our favorite team is as important as the manner in which Derek Jeter prepares for an at bat or the reason why R.A. Dickey struggled in Cincinnati. Fear of breaking from the routine is the reason why I have been so reticent to write about the Baltimore Orioles. As you may or may not know the Birds are fighting for a playoff spot for the first time in well over a decade. With a little more than a month remaining in the regular season Baltimore is currently tied for the Wild Card lead but faces stiff competition from the Rays, A’s, Tigers, and Angels. Today I’m willing to shelve my silence and superstitions in order to bring greater notoriety to a team, my team, that has continued to fight on through the dog days. Here are just a few reasons why. To steal a phrase from everybody’s favorite mid-90s sports centric rom-com, “You had me at hello Manny Machado. You had me at hello.“. There isn’t one person on the planet who could have predicted such a titillating start in the big leagues for one of MLB’s top prospects. Precocious baseball superstars have not been uncommon in 2012 (see Trout, Mike and Harper, Bryce) but what Machado accomplished in his first week with the Orioles surpasses what most fans thought possible for a 20 year old playing out of position. In his first four games with the Orioles, Machado went 6-16 with a double, a triple, 3 HRs, 7 RBI, and 5 runs scored to help him share player of the week honors with some guy from Fenway who allows teammates to borrow his phone and text message the owner. To think, some “analysts” thought his call up to the majors was premature and an act of desperation for a team searching for its first playoff birth in over a decade. Please, Machado was always the best available option at any level to help the big league club shore up its right side of the infield even after playing only two games at the hot corner in the minors. Along with the bravado of Machado (put that on a poster won’t you) comes the panache of Manager Buck Showalter which has clearly infected players like Mark Reynolds, the latter having disappointed for most of the season until he launched himself into the hearts of Birdland after one of the most memorable Charm City tirades since the days of Earl Weaver and Mayor Schaefer. Reynolds was thrown out of a game against the Detroit Tigers Friday night for vehemently protesting a controversial call at first base. (Editors note: Tim Timmons needs to eat more carrots.) His post game comments were a thing of beauty and while some outsiders may argue that what Reynolds did and said crossed the imaginary line between competitive spirit and entitled petulance most Orioles fans could really give two shits about what anyone else thinks. It’s about time this team and franchise started to act like they gave a crap because their aren’t many fans left walking around the Inner Harbor who don’t list the Ravens first and Orioles second in the battle for the hearts and minds of Baltimore. And how about a heaping of praise to Nick Markakis the RF who has reinvented his Orioles career with a transition to the leadoff spot in the lineup. The Greek God of Outfield Assists continues to get on base and hit for power. Some guys are just more comfortable in certain parts of the lineup and with Brian Roberts back on the DL, and JJ Hardy better suited in the two hole, the Orioles had very little choice but to go with Markakis and at just the right time too. Another key ingredient to the Orioles prolonged success through mid August has been the still sturdy bullpen which everyone from Pythagorus himself seems to agree is destined to eventually implode into a fiery inferno like the ill fated Hindenburg. 8th inning guy Pedro Strop gave up his first run(s) Saturday night since all the way back on July 5. (Complaining about quick pitching is for sore losers and public safety directors.) Closer Jim Johnson has 36 saves good enough for second in the AL and with a reprogrammed Brian Matusz perhaps the Birds will find the valuable left handed reliever they have been searching for. At the start of the 2012 season, most Orioles fans would have been satisfied with a final record at or above .500, a statistical feat that hadn’t happened since 1997, a prolonged streak of ineptitude that has many in Baltimore feeling like Captain Ahab. But now, 81-81 just isn’t good enough and with every series victory Baltimore becomes more and more resolute. The Wild Card is in our grasp. Take it. You never know when the opportunity will come around again. 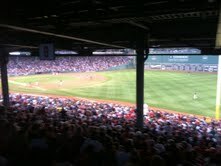 VMS reader Jimmy M. sends us this pic from last night’s Red Sox/Orioles game at Fenway Park. Full stadium on hand, as expected, to see Boston bludgeon the O’s by a final score of 10-3. But all anybody is talking about today is the “fight” between Red Sox DH David Ortiz and Baltimore pitcher Kevin Gregg. As Jimmy points out, the 8th inning provided and interesting series of events to have to explain to his 8 year old son Tommy. To be fair, what transpired between Gregg and Papi was a little a little confusing to even the most seasoned of baseball eyes. As far as I can tell, the Baltimore Orioles are upset because they are playing like horse manure, having fallen a total of 16 games behind the steamrolling Sox. Papi has been walking his way down to first base since his days as David Arias so I’m not so sure why Gregg was so compelled to scold Ortiz on this particular occasion. On the other hand, Ortiz has no business overreacting to being pitched inside. That’s where you go to get him out. Everyone knows this yet nobody executes this strategy properly – see New York Yankees. In the end, the only way Baltimore exacts any sort of revenge against Ortiz is to win the next two games vs the Red Sox before heading into the break. Even still, they would remain well behind Boston in the standings with very little cause for optimism over the remainder of the 2011 MLB season.